Itâ€™s been a bit crazy the last week, so here is the next part of the review. The post continues on from the first part of the review of the Moodle 2.0 First Look by Mary Cooch (@moodlefairy) from Packt Publishing. Mary covers resources in Chapter 4, Activities in Chapter 5, and Learning Path management in Chapter 6, Blogging, Comments and Messaging in Chapter 7, and Admin issues in Chapter 8. Mary leads the reader through the new resource dropdown where changes have hopefully meant less confusion for users in the coming years. She focuses on some of the changes such as permissions and display options. But this a shortish chapter with no real major changes to report except naming. The tempo through the chapter is kept nice and brisk. Mary immediately jumps in to the 3 big changes with the activity selection. This sets a very different tone to the previous chapter, with expectations raised. Mary brings us rushing through the significant changes through the Quiz engine, and although I wouldn’t be in agreement with some of the comments on the quiz but it is a fair overview. Mary briefly tackles the wiki next focusing on the improvements, however gives the Workshop the space it needs as it is a major revamp of the existing one. Marys’ explanation of the processes and features is clear and to the point, and it is clear that she likes the new workshop (as i am pretty sure everyone will). Mary runs through some of the other activities touching on key points with Scorm Package displays being neater before moving on the deal with one of the major changes to Moodle2, the learning path management features in chapter 6. Learning Path management was always going to be a big issue to deal with, as it brings together a few new features (which were sort-of available in Moodle 1.9 with a custom patch). Mary provides in depth explanations about why these features are useful and how you could use them, along with the settings you can choose from. Itâ€™s a good chapter, and even if it was the only chapter in the book, it alone makes the book worth buying. The book approaches the changes about Blogs, Messaging and a new feature of commenting in Chapter 7. Again the pace is slowed slightly, as some of the features are significant and require extra explanation, but overall the progress is good. Mary obviously likes the new comment aspect, which I am sure will get a lot of use in some sectors. Towards the end of the chapter the Feedback module is explained with a view to when it is enabled as default in Moodle 2.1. The last chapter highlights all the key areas that an admin has to think about, with the navigation and setting options, and there are a lot of changes to go through. Overall the book has been a joy to read, with a well-paced and friendly narrative. The key changes are highlighted and the new features well explained. 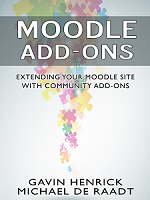 If you currently use Moodle 1.9 and are even thinking about Moodle 2.0, if you havenâ€™t already bought this book, my only suggestion is go get it! Thanks for the comment. I looked for lots of themes, wordpress has so many options Very hard to find one that is just so.